It’s Friday! I’d say it’s time for some beautiful libraries, wouldn’t you? 1. The Bodleian Library, Oxford, England. 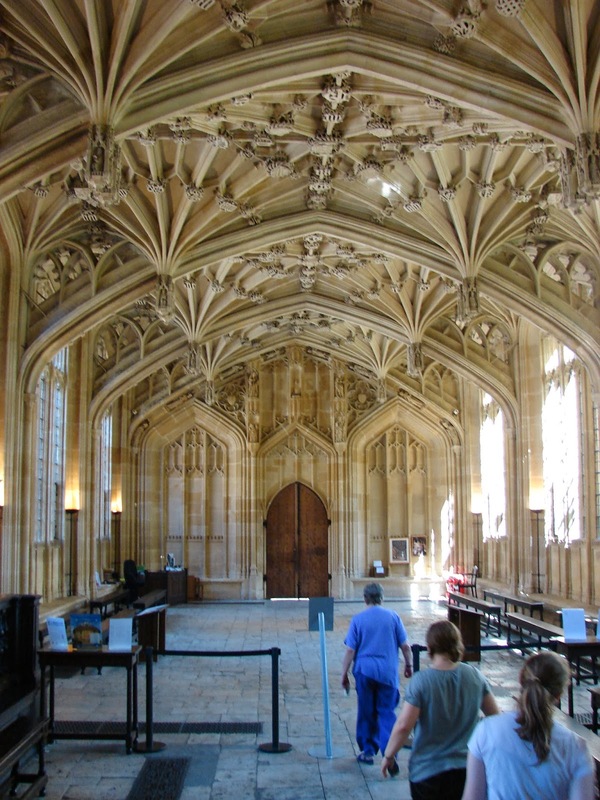 No library tour would be complete without the Bodleian, which houses 11 million printed items in addition to thousands of other materials. It actually consists of many different library buildings as well as a subterranean storage labyrinth. (Mystery novel, anyone?) The fan ceiling is renowned as one of the most beautiful in England. 2. The Wren Library, Cambridge, England. A small gem, tucked away in Trinity College, this library was designed by Christopher Wren, one of England’s most famous architects. 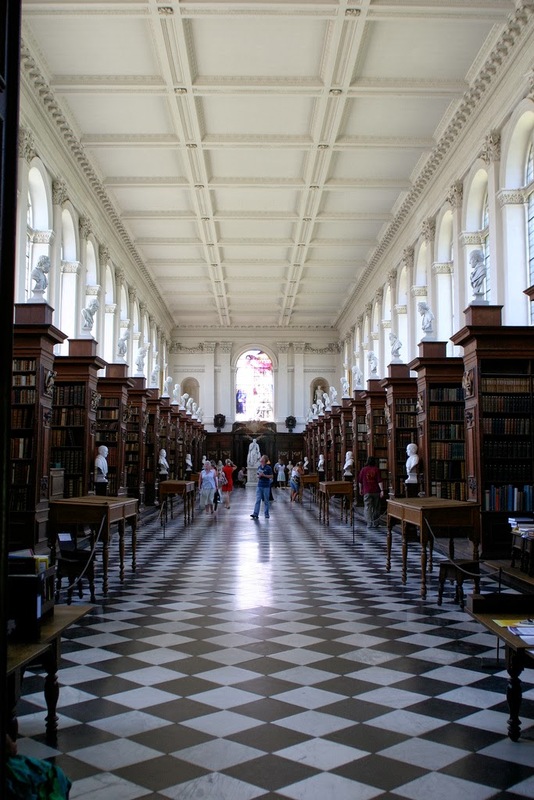 Containing first editions of works by Tennyson and Byron and the handwritten manuscript of Winnie-the-Pooh by A.A. Milne, the library also has a walking stick and lock of the hair of alumnus Sir Isaac Newton. Love the checkerboard floor, too–makes me think of Alice in Wonderland. 4. 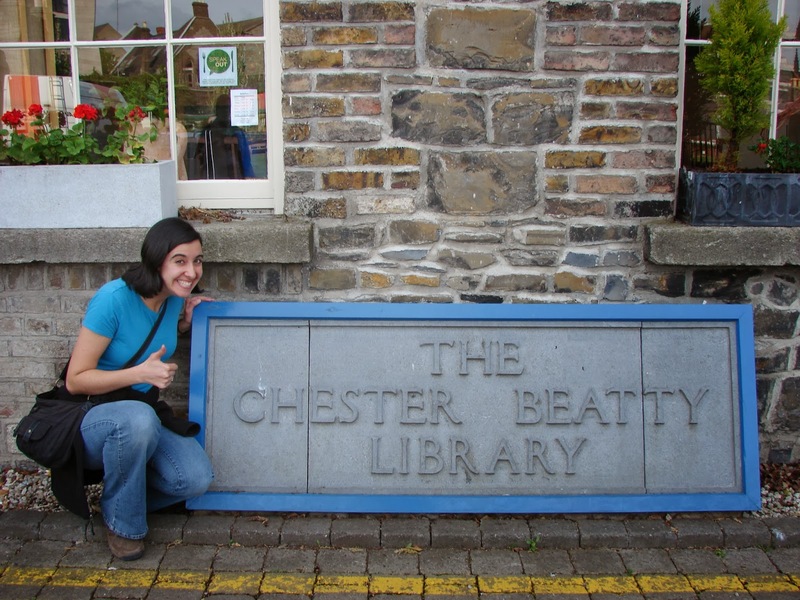 The Chester Beatty Library, Dublin, Ireland. A little-known gem I discovered quite by accident, this library is resplendent more with inner than outer beauty. More than a simple collection of books, it’s a curiosity cabinet of antiquities from all over the world, including some incredibly old manuscripts. Imagine illuminated texts, an ancient copy of Augustine’s City of God, and fragments of Bible papyri from as early as AD 150–yes, people, that would be an almost 1900-year-old book. Er, scrap of a book. 5. 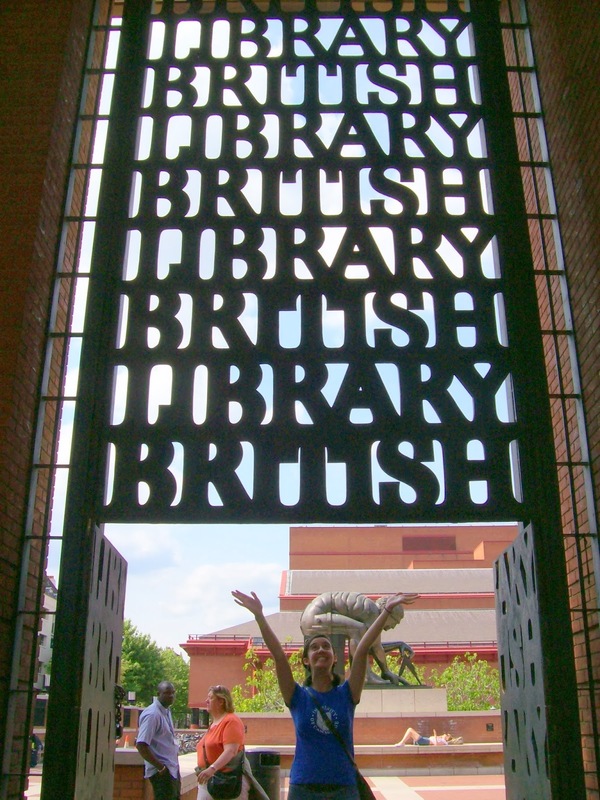 The British Library, London, England. Last but not least, a classic among libraries. Along with the Library of Congress, the British Library is the second-largest library in the world. Yes, world. It’s a legal deposit and research library containing over 150 million items. Contemporary architecture (including a bench shaped like a folded-open book) pairs here with a mind-blowing collection of some of the world’s oldest manuscripts. Inside you’ll find everything from Beowulf to Jane Eyre, from Handel’s Messiah to the Magna Carta, from a Gutenberg Bible to Anne Boleyn’s copy of the New Testament. It’s the Louvre of libraries. Bonus #6! 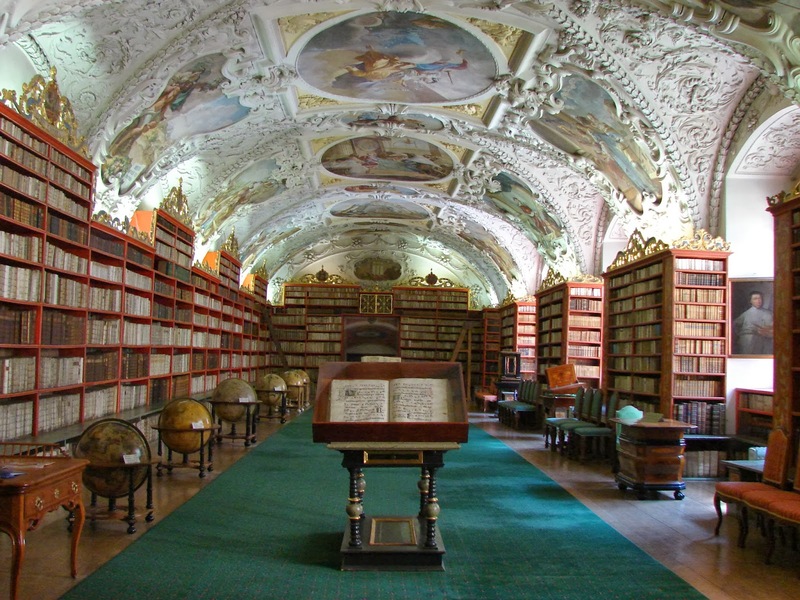 The Strahov Monastery Library, Prague, Czech Republic. Happy Friday! 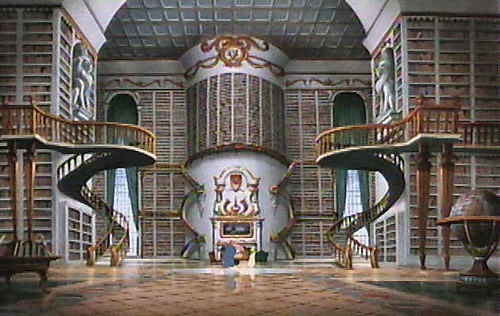 Which of these libraries (the Disney one included!) would you visit if you had the chance? Ummm, WHY do we have to choose only one??? The architecture is so beautiful, one might be tempted to ignore the books :o!The Wren Library made me smile: How funny that a library names after Christopher Wren houses the manuscript of a book about a boy named Christopher Robin…! Love the photos and stories, keep going!! 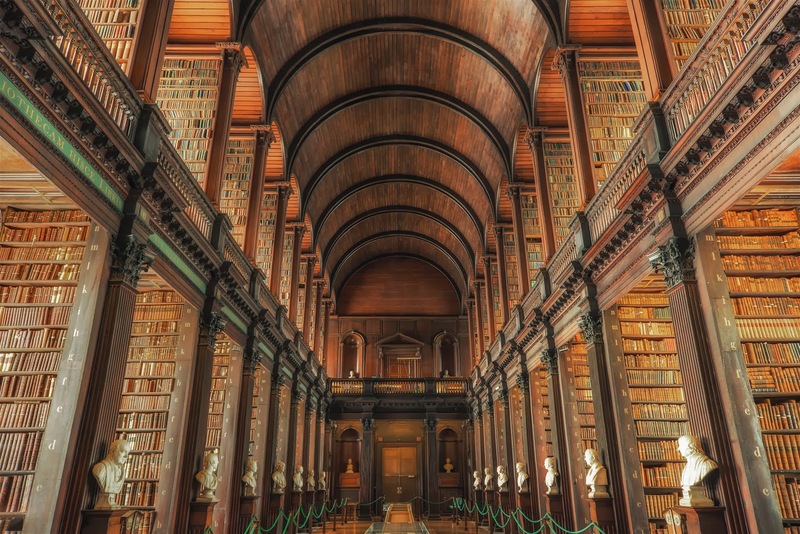 Wow, I’m not sure I’d be able to concentrate on the books in any of those libraries, such is their awesomeness. Amazing. I love them all! They’d be great places to get some writing done. Good idea! Libraries may not just be for the keeping of old books, but for the creation of new ones?